kandeej.com: Cheap Valentine's Day Ideas! what's say's Valentine's Day and love more than hearts and homemade craft! but if you make a card of Valentine's present...you'll be as one-of-a-kind as you are! write on the back in in a fun hot pink Sharpie pen...and -voila! You just created an awesome card and Valentine's decoration in one! BONUS: you can even buy a heart shaped lollipop (like the ones in the picture that I got from Wally World, too) and tape your "giant heart card" onto the lollipop! The World's Best Chocolate Cupcakes! :D I made choco cupcakes today!!!!! i might just have to make these tomorrow after work! I love all your tips and tricks and life lessons! I'm just glad you put it all out there for us to read and watch! Part time reader, and a full time friend! Love being sent from Ohio! I have yet to try those cupcakes! They look so good! aw so cute! i wish i had a kitchen!! Do you see this ? Well most likely you don't, but it's a huge smile from all the love and joy you bring to my life ! I'm so glad that I am part of the Kandee family this Valentine's day ! And I wish you, your babies, and you sweetheart the best of days! Much love to you, Sista' !!! 1. Break off the bottom half of the cupcake. 2. Flip it over and stick it on top of the frosting. 3. Enjoy your cupcake sandwich. It's perfect because you get even frosting distribution in every bite! I have been eating cupcakes this way since kindergarten... and I'm 21 and married now hahahahha. I remember watching this awhile ago! I made some cupcakes for my friend today and watch this video this afternoon!!! Lol.." time for a dance break" made my day. I can't wait to finish moving so I can unpack and make some cupcakes. Hope you have a wonderful valentine's day! hahahaa I love your videos. i love how you're all stylish to cook. I usually wear sweatpants and a plain shirt. My friend and I made peanut butter and jam cookies today, pushed little hearts in them for the jelly. super cute and fun--plus its cheap! Instead of canola oil can you substitute extra virgin olive oil instead? And if so, what is the measure ratio? make me feel so happy and dandy because you are sweet, like Kandee!! I made cupcakes for all the other staff where I work. I have to admit I bought a packet mix, but because the packet came with cute little tiny candy hearts to go on top and I couldn't find those separately. But I did do all the decoration myself, like making heart shapes out of chocolate for the top. It's fun to do things for other people on Valentines Day - making other people happy always makes you feel better than anything you could get for yourself. You are killing me here! I'm on Weight Watchers woman :) maybe I can make it for a special dinner in the future. Today it's my birthday and valentine's day! I think I will do these cupcakes for my fiance! I love love looooove cupcakes but I have an addiction to sugar, can you suggest any recipes for people like me? I have started a blog recently about my adventures (heehee) battling my sugar cravings and trying to eat healthy. Any tips and/or encouragement would be greatly appreciated! Happy Valentine's Day to you all!! I just have to share what my husband did. When I opened the door after getting home from work today he was laying on the floor just inside the door. He had a box of chocolate and jelly hearts candy on his chest and he yelled: I LOVE YOU!! And he had also bought me flowers and a beauty magazine which I got after I had given him a LOT of kisses. Isn't that cute!? Those are the most amazing cupcakes....ever! Thank you so much for sharing your recipe :) Happy Valentine's Day to you and your sweet little family! 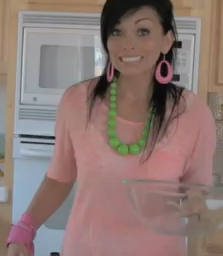 That cupcake video is CLASSIC KANDEE!!! I love watching it!!! I have used your recipe to make these cupcakes and they turned out delicious!!! My friends loved them! They scarfed them down the second I handed them out and were in love with the cream cheese frosting. Thanx Kandee! :-) There´s one thing you said that makes me think a lot - "Without salt sweet doesn´t seem as sweet". Well I told to myself - Isn´t this true also for life? Cause maybe without the "salt" (the bad things that happend to us) we might not apreciatte the "sweet" and the nice moments as much. I remember watching this cupcake video the first time you posted it on youtube, and I watched it all over again this year! I wrote down the recipe and made some tonight, SO GOOD!! YUMMY IN MY TUMMY :) Thanks for sharing - it is now in my recipe book and I called it "Kandee Johnson's Cupcakes"! you are such an inspiration and so beautiful. Thanks for making me a happier and nicer person. Keep sending out your love to the world. You crack me up Kandee. I always read your blog or watch your videos when I need to cheer up!! Love how you're not afraid to be you! How can you be so thin after giving birth?! LOvely recipe, going to try it out soon.